Wow what an amazing wedding season Sunshine Weddings Spain are having, the weddings this year have been fantastic and I can’t wait to share with you some of the fabulous celebrations that have taken place in all of our 3 Spanish Wedding destinations Malaga – Costa del Sol, Barcelona and Majorca. Over the next few weeks I will be posting some gorgeous pictures taken by one of our specialty wedding photographers along the Costa del Sol coastline & surrounding areas in Andalucía, David Toms, who does such an amazing job at connecting with all his bridal couples and capturing the most beautiful moments and colours which surround all our wedding settings in Southern Spain. Here are just a few photos to whet your appetite, which were taken from a stunning wedding held last June in Marbella, Southern Spain. 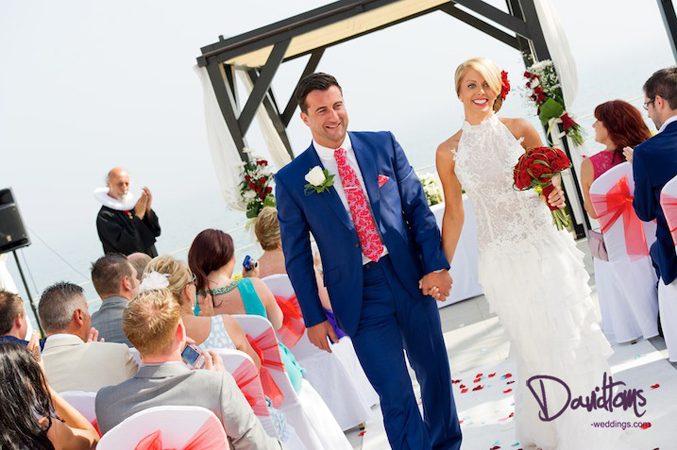 Our bridal couple Gemma & Gary, decided on Marbella in Southern Spain as their perfect wedding destination and after coming out to visit the Sunshine Weddings Spain Team fell in love with the Spanish coastline. Our stunning bride who wore a couture back-lass stylish wedding dress and chose to use a bright red, which some would find daring, but it worked fabulously. The colour oozed class and sophistication, adding a touch of Spain to the theme of their wedding and was used in such a way that was smart and classy for both the bridesmaids and groom and wedding party to wear. The Venue a hotel and beach club in Spain provided the most wonderful Mediterranean sea -view wedding ceremony back drop. Guests partied the night away dining outside under the stars to the beautiful Spainish Sunset. It was perfect for our photographer and bridal couple who’s photo’s were taken within the grounds of the wedding venue amongst lush gardens, on the beach and captured the sophistication of the hotels décor; simply beautiful! Huge congratulations to Gary and Gemma on their big day and for letting us share with you their pictures along with David Toms their wedding photographer in Spain!!! Please keep checking my Sunshine Wedding Spain blog updates so you can see for yourself how your dream wedding in the Spain can come to life just like it did for Gemma & Gary!